We exited the elaborate courtyard whose massive walls surround some of the holiest sites for the Ibrahimic religions. To Muslims, this is the location where it is believed the prophet ascended to heaven. The site is extremely protected and many people try and are unable to enter. Having attempted multiple times to enter during the extremely short and oddly timed tourist hours, we, myself and a friend I had met at the hostel, had decided it was time to play the Muslim card, that is, use the fact that we come from Muslim families to get into the beautiful holy sites. For my friend, this was literally a card. She possessed one of the controversial Turkish ID cards. Heavily criticized for including the bearer’s religion, it was that small crescent moon and star on her card that had allowed her easy access into an area many religious pilgrims never step foot in. My US passport had offered no religious evidence, obviously, but my Arab name and Arabic quickly convinced the guard who had greeted us with the only too familiar “Closed today, Muslims only,” to let me in. So, head scarves in place, we had entered into the peaceful sanctuary about an hour before. 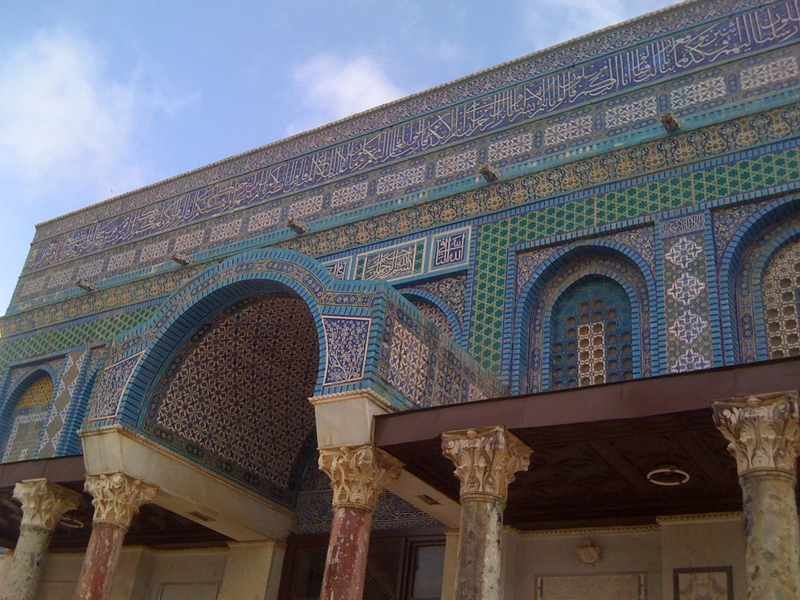 I was immediately mesmerized by the elaborate Dome of the Rock. Each inch of the massive structure is intricately designed with Byzantine art,and the gold domed roof, the staple of the Jerusalem skyline funded during renovations by Jordan, shines with a faith instilling vibrancy. Entrance into the Dome is prohibited, and while strict rules such as what religions can enter at what times, who guards the doors, and what places are off-limits are irritable to the curious visitor, it is diligent adherence to these rules that keeps the city from breaking out into violence. 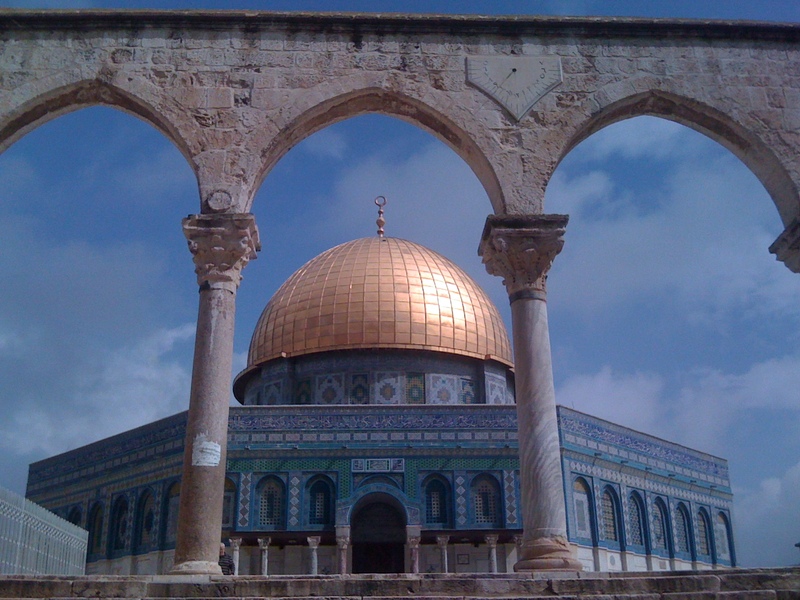 In fact, it was Ariel Sharon’s visit to the Temple Mount or Haram Al Sharif, (the name of the courtyard used by Jews and Muslims respectively) after Yasser Arafat refused to give up either the holy site or East Jerusalem during negotiations, which set off the First Intifada (Palestinian uprising) The solid rock under our feet was unsettled ground, and as I tried to capture the glow of the gold roof, its demand was no wonder to even myself, one of the biggest religious pessimists. We had moved on to Al Aqsa Mosque. We had entered the prayer area and were hit with a calm wave of energy, a sensation similar to the feeling of entering an air-conditioned room after being out in the heat. The comforting feeling of entering the prayer room in a mosque had beckoned us in from the political controversy that remained all around. The women’s prayer room was humble. Every few feet another small book-case was overflowing with copies of the Quran, the Sunnah, and the Hadith. A few people had been scattered about the room praying quietly while we looked around. Our final stop had been the Marwani Mosque. Known to some as Soloman’s Stables for the short period it had been used to hold horses during the Crusades. The mosque is located below ground. Recent renovations by the Israeli government underneath Al Aqsa have left visible cracks throughout Marwani, causing large protests from Muslims worldwide. We exited through one of the 11 gates around the courtyard, slipping out near the Muslim quarter. The rain was beginning to fall, and we found ourselves seeking shelter under a falafel stand. Sick of falafel, but happy to be out of the rain, I ordered a small cup of humus and purchased a kilo of fresh pita bread. As we waited out the rain, we began speaking to an older Arab gentleman. After finding that I spoke some Arabic he began with the usual list of questions, the answers to which revealed that we were both of Arab origin, with Muslim fathers, and were, of course, therefore Muslim. He immediately pulled us into the rain and beckoned us down the street to a location he didn’t find the need to share with us. Happy to have learned I am from Colorado, he began ranting in Arabic about the Colorado River, which he had seen on TV. “It is a big river, but not as big as the Nile or the Amazon. “ He continued as if he did not hear my repeated inquiry as to where we were going. This sort of event may seem strange, but very often we were ushered into a shop for tea or cookies, so we followed without much question. After about 5 minutes of walking down the soaked and muddy rock road of old Jerusalem we found ourselves at another entrance to the courtyard, whose wonders we had just experienced less than 30 minutes before. At this point what was going on became clear. This man, upon discovering our Muslim heritage had taken to escorting us on a pilgrimage to the Temple Mound/ Haram Al-Sharif, not realizing that we had already been into the site. “Muslims only” came the warding off by the soldier at the gate. The old man approached the IDF guards and began explaining to them in Arabic, that while we do not look Muslim, we were in fact, and that they needed to let us in. The conversation that ensued included 2 languages and zero communication. “Shukran Amu, bes….” (Thank you, Uncle, but…) I said to the old man, but he continued to argue with the guards, one of which had begun demanding our passports from us to see if we were Muslim. “Amu, we went to Al Aqsa already,” I paid great attention to make sure I got the past tense correctly in the Arabic sentence so if he didn’t understand that we had already gone, maybe the guards would. “Bil Araby” (in Arabic) He demanded that I communicate with him in Arabic. I was speaking Arabic. And very simple Arabic even. At this point the guard was getting impatient. Having acquired my companion’s passport and religious verification, he turned to me. “Give me your passport.” The old man continued to speak to the other guard in Arabic asserting our religion and insisting our admittance. At this point surrendering my passport seemed easier than arguing. Was it because I was a woman that they weren’t listening to me, or because none of us spoke fluently the other party’s native tongue? Here the guards who spoke Hebrew to each other were speaking Arabic with the old man, but English with us. I was speaking, or I guess attempting to speak, Arabic with the old man, and English with the guards. And the old man was speaking a bit of English and Arabic. Regardless of the words being spoken, none were being heard. I handed over my passport, which did little to convince the guard that I was Muslim. Having quieted the guard for a moment, I returned my focus to the Old Man, but he wasn’t listening to me, but rather waiting for the verdict on my entry from the guard. “Yalla, Al Fatiha” He demanded me to recite the first Surah in the Quran. “Yalla,” the Old man echoed the guards command. “FINE!” I gave in and at a speed hastened by my frustration and bafflement, I recited the most famous verse of the Quran. The guard, satisfied, gestured toward the gate. And submitting to our fate, we followed the old man into the familiar courtyard. Once inside the old man welcomed us and pointed out Al Aqsa Mosque. Satisfied in his success at taking two Muslim girls on one of the most significant pilgrimages they can make, he left out the gate. We stood in silence staring at each other before we broke out laughing. Here we were at one of the most worshipped places, where thousands of Christian pilgrims are denied entry every day, especially on Fridays such as today when no tourists are permitted in due to Muslim prayer. In fact, many Christians have covered their heads and tried lying to get in (hence the recitation test). We had been lead there, and despite our drawn out resistance, been forced into the sanctuary.We took one last walk around the grounds then exited through a different gate. Later that day, as we wandered through the mystical old city, we unintentionally started down one of the many small roads that end at one of the gates into the too familiar mound. “Closed. Muslims only” came the call like a broken record. “We know.” we giggled as our response puzzled the guard. We turned around. “All roads lead to Al Aqsa” became our old city wanderings mantra. All roads lead to Al Aqsa. 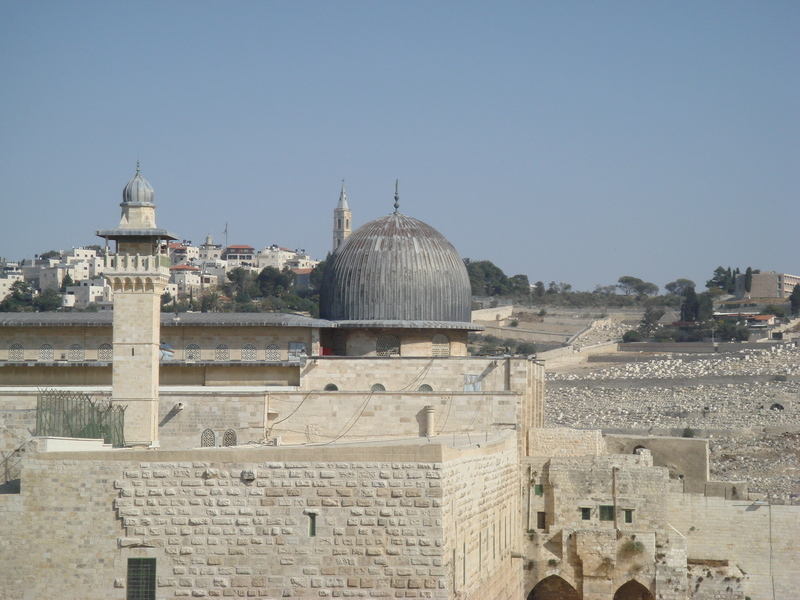 This entry was posted in A Penny for My Thoughts..., Both Sides of the River, Palestine, The Holy City and tagged Al Aqsa, Al Khuds, Dome of the rock, Holy Mount, IDF, Jerusalem, mosque, Muslim, palestine, Solomon's stables, turkish. Bookmark the permalink.